Cast your minds back to 12 months ago, Newcastle were due to start their season at home to a North London team that finished 4th in the previous campaign. The mood around Newcastle wasn’t brilliant in relation to the team’s chances of taking anything from the game, let alone the upcoming season. However, the Magpies managed to take the first point of an incredible 65 in a hard fought stalemate against Arsenal. One year on and Newcastle again open the season against a 4th placed North London outfit on home soil, only this year the opponents have changed, as have the players in black & white. Last year, there were some 6,000 empty seats in St James’ Park for the visit of the Wenger boys and the odds on a Newcastle Top 4 finish were a hefty 100/1. This year, the Spurs game is nearing a sell out and those odds for Newcastle to make the Champions League come May have been slashed to a best price 18/1. The incredible 13 game unbeaten run at the start of last season brought with it a tidal wave of confidence, both for the players in their own ability but also from the stands – a renewed bond of trust and pride from the Geordie faithful in those chosen to represent them – the like unseen in the top flight on Tyneside since the Robson era. I was one of the optimistic few that attempted to take advantage of the (what I thought to be generous) 100/1 odds on offer for a top 4 finish. 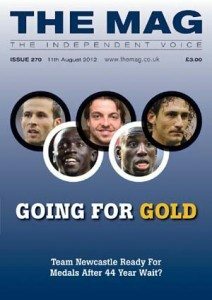 The reasoning behind my optimism was based around the replacement of Nolan with Cabaye and my confidence in both Krul and Ba, both of whom had their doubters prior to the start of the season. In the end the team fell at the final hurdle in the race for 4th but they proved countless doubters wrong along the way. Unlike last year, the fan base and team seem to be united in their belief that the squad has plenty of talent and the ability to achieve something special. The team spirit and camaraderie is excellent and this is now mirrored in the stands. When the fans trust and believe in the eleven players in black and white they can go a long way towards epitomising that often overused, clichéd expression, ‘the twelfth man’. You only need to look at the comfortable home victories over Man Utd and Liverpool for proof of that. When St James’ is rocking like it was for those two matches, you’ll be hard pushed to find a better example of how the home crowd can help their team. Last season the team was deprived of the services of various key players for large parts of the campaign. Steven Taylor was an integral part of the country’s best defence until he injured his Achilles at home to Chelsea, ruling him out for the remainder of the season. Hatem Ben Arfa was injured at first before struggling to adapt to the English game. We only really saw the best of him in the last 10 games of the season, with his world-class demolition of West Brom a particular highlight. Up front, we only had Papiss Cisse for 4 months whilst Demba Ba suffered from a positional change and a loss of form in the second half of the season. The prospect of the two of them hitting form simultaneously is exciting to say the least. Combine them with a motivated on-form Ben Arfa and Newcastle have a front three to match any in the Premier League. Vuckic, Ferguson, Tavernier, Sammy Ameobi, Abeid, Bigirimana, Campbell… I could go on. Rarely in the Premier League era have Newcastle had such a promising Academy production line. Our squad now contains a decent amount of talented youngsters ready and waiting to make the step up to first team football and with the club’s participation in the Europa League, they will soon get their chance. Add to these the likes of Steve Harper, James Perch, Sylvain Marveaux and the indomitable Shola Ameobi and the squad looks well equipped to cover the increased fixture list, as well as suspensions, short term injuries and absences. Obviously injuries to key players and January’s African Cup of Nations could cause havoc to Newcastle’s season, whilst the likes of Chelsea and Liverpool can seemingly only improve on their performances in 2011/12 but otherwise, I firmly believe that Newcastle can emulate last season’s fantastic campaign and who knows, maybe a Top 4 finish could be on the cards?